It’s the news all Samsung fanatics have been waiting for… the highly anticipated Samsung Galaxy S9 will be making its debut appearance at MWC 2018 on Monday 26th of February. The device is expected to shake the mobile phone industry with its ultra high spec, giant display screen and groundbreaking cameras. For now, all information circulating around the globe are rumours or unofficial leaks but you can guarantee that Samsung will push the boundaries with their upcoming flagship phone. The price for this device is yet to be revealed but after researching previous flagship models and their initial prices, although recent leaks suggest the price will fall just over $850. For the average joe, it’s a huge chunk of cash to depart with. Monthly deals will also be extortionate, however selling your unwanted phone could boost your bank balance and help you afford the device of your dreams. But when is the best time to sell your phone? The answer is now! Figures suggest that after the announcement of a new flagship model, buyback companies will increase their prices until its release date. You could make up to 20% more if you sold your unwanted items now. Table i: The chart above shows the best prices you could receive when trying the sell or trade-in your Samsung Galaxy S7 (32Gb). 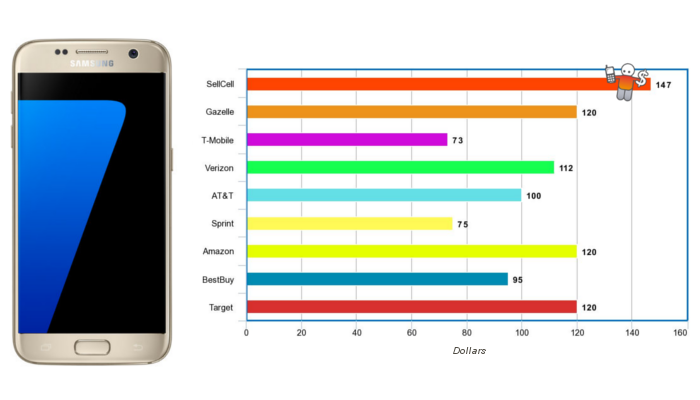 Table ii: The chart above shows the best prices you could receive when trying the sell or trade-in your Samsung Galaxy S7 Edge (32Gb). SellCell works alongside market-leading buyback companies to offer the best price for your Mobile Phone and Tablet devices. 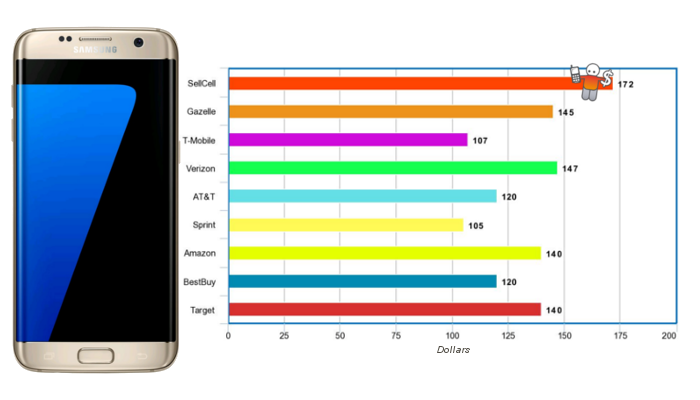 As the table indicates, SellCell.com produced the highest price for both the Samsung Galaxy S7 and S7 Edge, coming in at $147 and $175 respectively. These prices outweigh all carrier trade-in deals, vendor gift-cards or cash payments. By selling your Samsung through SellCell.com, it gives you the flexibility to search countless plans and contracts with no strings attached! As well as knockout prices, SellCell slap a 24hr Price Match Guarantee on all devices sold through the site. The best price guarantee ensures that you will get the best price for your Samsung. If you are to find a buyback company with a higher price after 24hrs of selling your device, they will double the difference. Gazelle are one of the biggest mobile phone and tablet buyback companies in the US and offer some reasonable prices for both models. To sell a working Samsung Galaxy S7 you can expect to receive around $120 and for a Samsung Galaxy S7 Edge in the region of $140, dependent on its condition and the Carrier it’s tied with. As well as being one of the most renowned Buyback companies around, Gazelle also own ecoATM, a localized scheme that sees vendor machines dotted around retail parks and other convenience stores. However, convenience comes at a cost, with prices dipping to around $40 and $60 when both in working condition. That’s a hefty price difference! All leading Carrier Networks offer trade-in deals. This is a needless option until the S9 has been announced and a release date has been confirmed. However, this element of the investigation will give you an indication/understanding as to how much you could receive from all four major carriers. The amount of credit you could gain from the sale of a Galaxy S7 & S7 Edge varies dependent on the carrier you are contractually bound to. T-Mobile offer the lowest amount at just $73 and $107 for each phone. Both AT&T and Sprint offer reasonable prices but its Verizon who offer the tastiest deal at $112 and $146 for each device. Similar to both vendors and retail stores such as Target and Best Buy, the proceeds from your unwanted phone are transferred to a virtual gift card, restricting you to splashing the cash on the e-commerce site. For the avid Amazon user, this is a god-send but if you are hoping to search around other vendors and networks, there are more practical options. Leading vendors, BestBuy and Target, offer contrasting prices for the once flagship series. If you were to consider selling your Galaxy S7 to either of these vendors, expect to receive around $95 and $120 when in good, working condition. Both stores propel their prices for the Edge, seeing profits of up to $120 and $150 from each vendor. Retail Buyback Schemes are great if you are looking to buy your new device from the same vendor. Although, just like the Amazon trade-in scheme, once you have sold your phone to a particular superstore, you are unable to spend the credit at another store or Carrier Service. There are many options you could take when selling your old phone, particularly the Samsung Galaxy S7 and S7 Edge. Prices fluctuate dramatically between, buyback companies, vendors and carrier networks from as low as $40 to as much as $173. As stated above, there are three dominant options when selling your unwanted device: Trade-in deals, gift cards and cash payment. Each have their pros and cons. When looking to transfer from one phone to another, a carrier trade-in scheme is a worthwhile investment. While a gift card from a chosen vendor gives you more options and availability. Virtual credit allows you to wait for future deals and offers. In Conclusion, the most efficient option when selling your current or old cell phone is to sell through a buy back company. Offering the highest prices and bank or cash payment, it’s hard to find an issue. When selling your phone to a buyback company there is complete freedom to choose the deal that you desire. No strings attached. If you are looking to sell your Samsung, look no further than SellCell.com. Click here to view the best prices on the market.